About Srikalahasthi Rudrabhishekham pooja: Srikalahasthi temple is one of the five shiva temples in India and is regarded as Rahu ksetra and Dakshina Kasi. According to Hindu mythology lord Shiva killed Rahu and kethu during samudra amnthan. 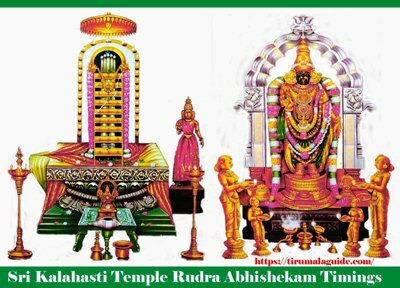 Hence it is believed that srikalahasthi temple brings amazingly good results when kala sarpa rahu kethu pooja and rudrabhishekham pooja is performed at shiva temple in srikalahasthi (Near Tirupati), Chittor Dist. Srikalahasthi temple is located in the town of srikalahasthi in the state of Andhra Pradesh. The temple is revered as one of the pancha bootha stalam where the presiding diety is worshiped as vayu linga. This temple is considered as kasi of south India. This is the only temple in India which remains opened during solar eclipse and lunar eclipse. While all other temples are closed. This temple is famous for kala sarpa dosha nivarana rahu kethu pooja and rudraabhishekham for kalahastiswara swamy (Lord Shiva). It is believed that performing this kala sarpa dosha nivarana pooja will ward the people from astrological effects of Rahu and Kethu. Rudrabhishekahm is the pooja process conducted to the lord Shiva. In this Rudrabhishekam pooja where to the kalahastiswara swamy (lord Shiva) is worshipped in his rudra form. It is one of the greatest pooja to remove all evils, to attain all desire and for all round prosperity and peace. kalahasti temple rudra abhishekam online booking was not available. In this we provide you the information about the timings and cost of the rudrabhishekham ticket. The below are the follows. After the completion of the Rudrabhishekham devotees are awarded with 4 laddus, 4 vadas, 1/2kg of pulihora and panchamrutham. Devotees should follow the dress code. And there is no online booking facility for rudrabhishekham seva; we can get the tickets at temple premises ticket counters only.